Professor Barr’s research career began as a student of Madison Spach and John Boineau of the Department of Pediatrics, on projects about the experimental study of body surface potentials in children and the experimental measurement of their origin from potentials in the heart. Professor Barr developed the original mathematical strategy and computer programs for the first stable method of computing of body surface potentials from those on the cardiac epicardium, taking into account the irregular shapes of both, a computational plan now known as the boundary-element method. He originated one method of inverse calculation of cardiac epicardial potentials from body surface potentials using statistical constraints. With Robert Plonsey he exploited the introduction of the cardiac bidomain model to show the looping current flow patterns that must exist in cardiac muscle and the unexpected propagation sequences that can result. This work formed the basis for the solution of a number of problems in field stimulation, threshold variability, and defibrillation mechanisms. Together they also wrote the text Bioelectricity, A Quantitative Approach 3E (Springer). More recently he has been involved with models of the movement of DNA under the influence of electric fields, with Professor Fan Yuan of Duke, and measurements and models of the junctional resistances between cardiac cells, with Professor Andrew Pollard of the University of Alabama at Birmingham. In 2008 Professor Barr received the IEEE-Engineering in Medicine and Biology Career Achievement Award, that organization’s highest honor. He gains particular satisfaction from the multitude of ongoing professional accomplishments of several generations of undergraduate and graduate students whose early contacts with bioelectricity were his classes or under his mentorship. Roger Barr lived by the train track until age 7 and has been a lifelong train enthusiast. 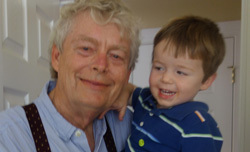 When not teaching Bioelectricity to residential and online students, he enjoys playing with his grandchildren or operating amateur radio station N4GF.